Sorbet and Italian ice are two ice-based confections that are recognizable by their sweet, often fruity flavor. Many people confuse sorbet and Italian ice because of their similarities in flavor and composition. The primary difference between Italian ice and sorbet is in the texture -- Italian ice is more grainy and icy, while sorbet has a smoother mouth feel. Sorbet can also contain alcohol, which contributes to the smoothness of the composition and texture. Fruit flavors dominate both sorbet and Italian ice offerings. 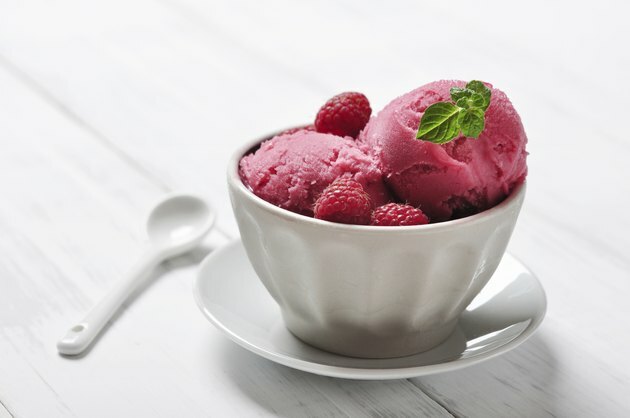 Sorbets are often found in lemon, lime, cherry, blackberry, mint, strawberry, blueberry and raspberry varieties. There are also a few specialty flavors that high-end ice sorbet shops experiment with, such as pistachio, pear, persimmon, pink grapefruit, grape and nectarine. Italian ice comes in similar fruit flavors and can also include mango and pineapple. Both Italian ice and sorbet can come in chocolate and vanilla as well, although it's more unusual to find those flavors without the creamy base of other iced desserts. The texture is the primary difference between sorbet and Italian ice. Italian ice, which is also known as water ice or shaved ice because of its composition, generally comprises grainy, ground ice that contributes to a slightly gritty texture. Sorbet, on the other hand, is characterized by its smoothness, which is achieved by a higher blend and a different ratio of sugar and flavoring to the ice. In some sorbet recipes, alcohol is included to give it a smoother texture, because the alcohol lowers the freezing temperature of the ice. There is a considerable difference in the nutrition of sorbet vs. Italian ice. A 1-cup serving of lemon sorbet contains 259 calories, 190 milligrams of sodium and 64 carbohydrates -- 50 of which are sugar carbs. The same size serving of lemon Italian ice contains 120 calories, 10 milligrams of sodium and 30 carbohydrates -- 23 of which are sugar carbs. Neither product contains any fat, but the Italian ice contains 1 gram of fiber. The sorbet has a higher vitamin C content, with 20 percent of the recommended intake vs. 2 percent from Italian ice. Both sorbet and Italian ice are created by freezing ingredients into ice during the process of crushing it. Cheap, quickly prepared Italian ice is sometimes made by adding a fruit concentrate to shaved ice, but this does not reflect the true preparation methods that distinguish authentic Italian ice. The ingredients used in both sorbet and Italian ice are essentially the same -- water, ice, sugar and flavoring ingredients. A different ratio of ice to water and sugar is used depending on the type of flavor and desired consistency of the end product. Sorbet is a more "high-end" ice confection than Italian ice, and the price generally reflects this. At specialty sorbet shops, a few scoops of sorbet can run between $5 and $10. Italian ice can be found both cheaply and expensively, depending on the quality. Many grocery stores stock Italian ice for between $5 and $10 for a quart. A small cup of Italian ice can cost between $3 and $6, depending on the quality.